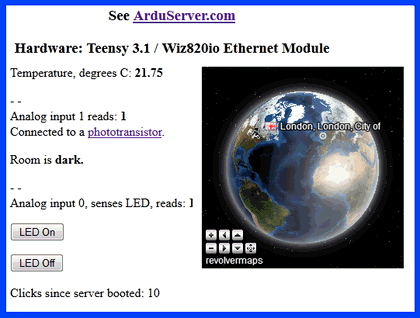 An ArduServer is a web server built in an Arduino. The only client software you require is an ordinary web browser, e.g. Firefox. The demo servers feature an LED and a light sensor. With an ArduServer you only need a browser to turn the LED on or off, and you can “see” what the light sensor sees… from anywhere in the world! The LEDs and light sensors are just “stand ins” for whatever effectors and sensors you want to access across a LAN, or across the internet. An ArduSimpSrv is easier to make… so the Arduino is not as “stressed” by the serving, and thus more other things can be done in it than if the Arduino has to be a web server. It also has an LED and light sensor, again as “stand ins”. But an ArduSimpSrv needs “bespoke” client software.